“I’m off to an astrology meeting” “Uh huh!” I said, non-commitedly. “Yes”, he replied, “would you like to come?” “Errr… no thanks” I replied. We walked on towards the bus stop in companiable silence. As we approached the bus stop, he added: “Funny really, whenever I go to these meetings there are always seven girls to every one bloke.” When the bus came, I hopped on with him, and went to my first astrology meeting! I then embarked on my astrology training. Nowadays it can be taken at degree level, but I only studied for a couple of years part time. It got a bit boring after a while having so many women around but I persevered. Synchronisation is the difficult bit. 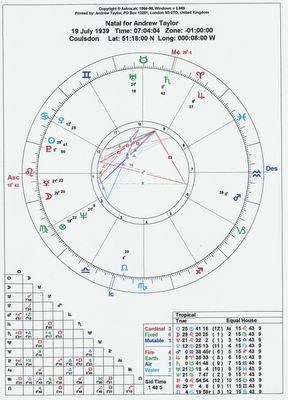 Most of the world only know their sun signs, nut your ascendent, which moves into a different sign every two hours, is the most important one. Learning that I was born on the 19th of July would inform the uninitiated that I was a Cancerian. However, a serious astrologer, once he learned of my time and place of birth as well, would say I was a Leo (ascendent) with sun in Cancer. But enough of this. This blog is about the stupidity of the media putting a twelth of the entire population into one box to write about. There are twelve signs of the zodiac, if we then take the sun and planets and ascendent, and one or two others, we have another twelve. Now take those into consideration with the signs of the zodiac and we have 144 different types of people. Now we take the twelve houses and we have 1,728 different aspects of charater. Then we look at the amount of degrees between all the planets, ascendent etc and we can change those personality traits depending on how far or how near lins are drawn on the chart between 30, 60, 90, 120 and 180 degrees. Depending on the above “lines” we can use degree ratios between 2 and 8. The we need to see whether the differences are waxing or waning, and this get even more “differences”. Many astrologers use even more aspect ratios. We are now talking millions and millions of different types. What brought this rant on? An astrology holiday feature in the Saturday Mail. I reproduce it here with my comments in square brackets. Family-orientated Cancer needs to feel at home — wherever that may be. As a Water sign, you are emotional and sensitive and happiest by a lake or river. Good matches are canal boating in the Netherlands, Germany or the UK. Sensitive and nostalgic, you would hate forced entertainment, or being thrown into a ready-made family not of your choosing. Cancer, the Crab, is very private and does not like its shell prised open against its will. A coach tour of European cities, Butlins or Disney World would make you retreat into your shell. Declare your love in the romantic Highlands or islands of Scotland — you have a strong affinity for family and your roots, so stay at an ancestral home by the sea, where Cancer the crab can enjoy paddling in the rock pools on the shore. Rest and Relaxation: Cancer rules both Scotland and Mauritius. With educational Saturn in your sign until July, you’ll find the peace and quiet you need to reflect. Navigate a boat along the German waterways, no experience necessary. A four-berth, two-bathroom boat with fitted kitchen and lounge costs £1,555 for four people. Departure from Potsdam, May 14. Book with Connoisseur Travel on 0870 1605648 or online http://www.connoisseurafloat. But then, they didn’t know that my ascendent was in Leo, and the moon, mercury and pluto planets were all in Leo! 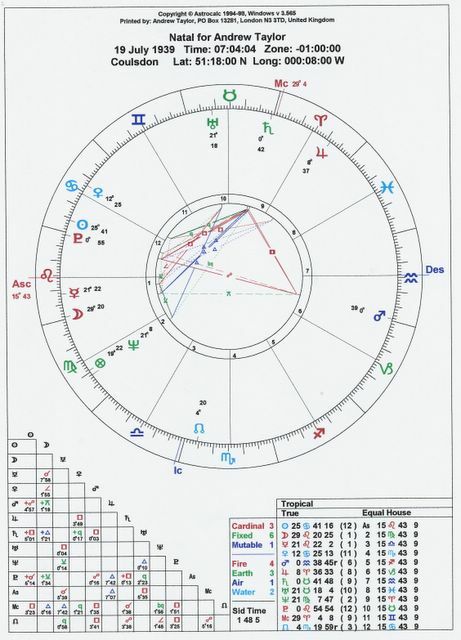 Andrew – a Leo with sun in Cancer!